When you hold a fresh apple in your hand, you can trace it back to having been picked off a healthy tree. When a room is flooded with light, you can trace the light back to the powerful source. Similarly, our behavior can be traced back to the teachings of our faith, of our Infallible Guides, and ultimately of our Lord. The question is - are we living in a way that is worthy of being traced back to them? No matter the time, place or age, we must try to live as Muslims in the true sense of the word. Sure, we cannot reach the height of infallibility as our Ahlul Bayt (peace be upon them), but that does not mean we should give up being good altogether. If it were pointless to try and emulate them, we would not have been instructed to do so. "My father, Musa son of Ja'far, narrated to me from his father, Ja'far son of Muhammad, who narrated from his father, Muhammad son of Ali, who narrated from his father, Ali son of al-Hussain, who narrated from his father, al-Hussain son of Ali, who narrated from his father, Ali son of Abi Talib, who said, I heard the Prophet (peace be upon him and his progeny) saying, 'I heard Jibrail saying the Almighty Allah has said, "I surely am the God besides whom there is no god, so worship Me. Whoever comes with the testimony of Tawhid sincerely, he has surely entered My castle; and whoever enters My castle, he shall be protected from My chastisement.'"" 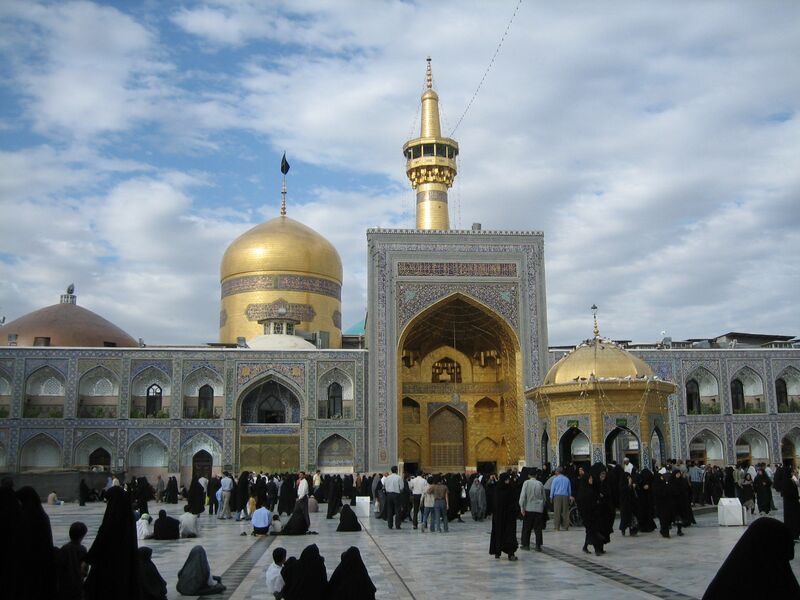 Imam Ridha then continued with a qualifier: "With its conditions; and I am one of its conditions." So saying, he departed to complete his journey. We must take this Hadith with the Golden Chain of Narrators to heart and strive to live by it. Without accepting the Imam and his ways, we cannot truly be representatives of our faith just by testifying the Oneness of Allah. Accepting him does not mean simply praying five times a day and reciting the Qur'an; rather, it means trying to implement his teachings in all aspects of our lives. Do we respect others as he did? Do we speak out against racism as he did? Do we give as generously as he did? Do we speak as gently and confidently as he did? Imam Muhammad Taqi al-Jawad (peace be upon him) was once asked why his father in particular was called "ar-Ridha" while all the other Imams were technically also "ar-Ridha". Imam Jawad replied, "Because both his opposing enemies and obedient supporters were pleased with him, while this did not happen to any of his fathers, so only he was called ar-Ridha." (Bihar al-Anwar) So endearing was his character that everyone loved the Imam! Let alone pleasing our enemies, is our character even such that we please our near and dear ones? We definitely do not want to have to hide our faces when our Awaited Savior (may Allah hasten his reappearance) returns. It should be obvious that we are followers of Imam Ridha. When discussing a controversial issue with others or trying to prove a point, we should remember to speak without using foul language or raising our voices. When correcting someone - be the mistake trivial or enormous - we should remember not to embarrass them by making fun of them or correcting them rudely in front of a crowd. When interacting with others, we should remember not to degrade some and elevate others just because of their skin color, wealth, or talents. In addition to the basic tenets of our faith, it is in these seemingly little things that we can improve our status as representatives of the Ahlul Bayt and in the eyes of Allah. It seems simple enough, but those characteristics are ones that we should strive to improve upon to please our Lord. As Imam Ridha left his family and journeyed to a strange land farther than any of his forefathers had, he was repeatedly offered corrupt power, yet always maintained his focus: the pleasure of Allah. The Imam's God-consciousness in every situation gave him the upper hand over the world, because he did not get caught up in worldly status and wealth. In another narration, the Imam is said to have been given the nick-name of ar-Ridha because "he is the good pleasure of Allah, the Most Exalted, in His heaven, the pleasure of His Messenger, and of the Imams after him on His earth." (Bihar al-Anwar) He was content with whatever Allah presented, and that helps in giving importance to the next world rather than to this one. If we focus on gaining nearness to the Almighty, our struggle will be so much easier because we will see no point in doing something which displeases Him and repels others from the divine religion. If we really seek Imam ar-Ridha's intercession on our behalf, and if we wish to be proper representatives of Islam, then we must work for it. By doing so, we will strengthen our faith and invite others towards the Religion of Light. When people see us, do they see a sign of the Ahlul Bayt's teachings? Is our demeanor a reflection of proper Hijab that they taught? Is our behavior towards the elderly an example of the respect that they taught? Are our words a mark of the cleanliness and truth that they taught? If a fresh fruit is a sign of a healthy tree and a lit room is a sign of a strong light source, then let us be signs of the righteous teachings of the Supreme Lord's beloved ones. Just as - when Imam ar-Ridha listed the golden chain of narrators - no one was surprised that the Imam could be traced back to such noble personalities, it should not surprise others that we are followers of the blessed and pure Ahlul Bayt.